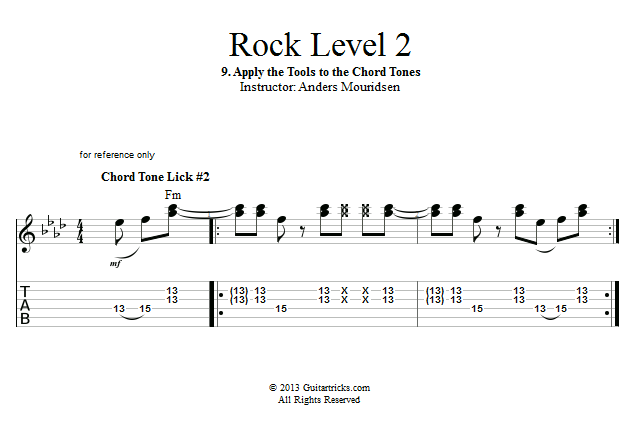 Now that we've applied some of the tools of expression to one of the meat 'n' potato rock licks, let's try the same thing with one of our chord tone licks from the previous tutorial. These chord tone licks were constructed to outline major chords, and the backing track of this tutorial is in a minor key. But chord tone lick #2 still works as a chord tone lick when you move it up to the minor position, so that's the one we'll use in this lesson. Picking the right notes to play is not even half the battle when you're making music. If you don't put some feeling into them, they're not going to sound like music, no matter how great your technique is, how much advanced stuff you know, and so on. When I always say that it's not how much you know - it's what you do with it that matters - this is exactly what I'm talking about! You'll hear many guitar players who are doing everything they're supposed to, and yet it's completely uninteresting. Most often the reason is that they're not playing with emotion! 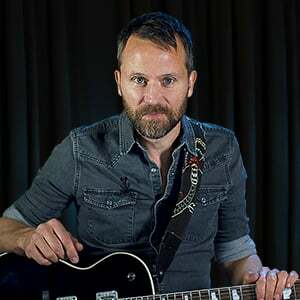 Using the tools of expression that we've explored today won't make this happen automatically, but they can help you get in touch with this crucial aspect of guitar playing.